President George W. Bush might have been in mourning Wednesday at his father's funeral, but he still managed to reach out with a friendly gesture to former first lady Michelle Obama. 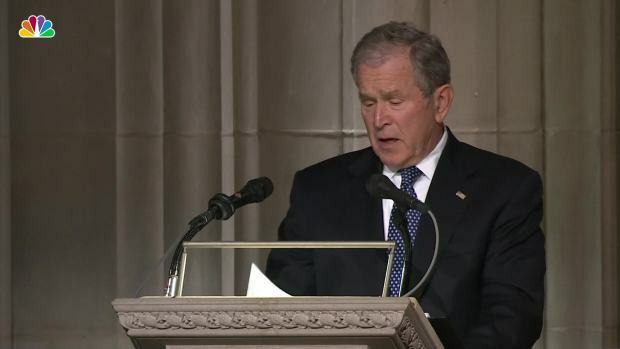 As Bush greeted the other living former presidents and their wives at the National Cathedral in Washington, where they were gathered for George H.W. Bush's state funeral, he seemed to slip something into Michelle Obama’s hand, bringing a grin to her and former President Barack Obama's faces. It wasn't immediately clear what he passed her — he didn't make reference to it when he spoke for his eulogy — but it's not the first time he and the former first lady shared a moment of levity in a time of mourning. At the late Sen. John McCain’s funeral in September, Bush and Obama bonded over a cough drop. Obama said on the "Today" show that they have become “partners in crime” at every official function because White House protocol mandates that they sit next to each other. "I love him to death," the former first lady said of the 43rd president. "He's a wonderful man. He's a funny man." During McCain’s funeral, Obama asked Bush for a cough drop after he passed one to his wife, former first lady Laura Bush. Obama later realized that the cough drop box sported a White House official seal, possibly making it at least a decade old. On social media, many people commended the act of friendship between two figures from different political parties. The duo’s relationship goes back further. In 2016, the bipartisan pair shared a hug at the National Museum of African American History dedication ceremony. On a 2017 episode of "Ellen," Bush told host Ellen DeGeneres that his friendship with Michelle Obama took many people by surprise. "[The friendship] surprised everybody," Bush said. "That's what's so weird about society today: [the surprise] that people on opposite sides of the political spectrum can actually like each other." Despite the good relationship between Obama and Bush, the combination of former presidents and first ladies in the first pew of George H.W. 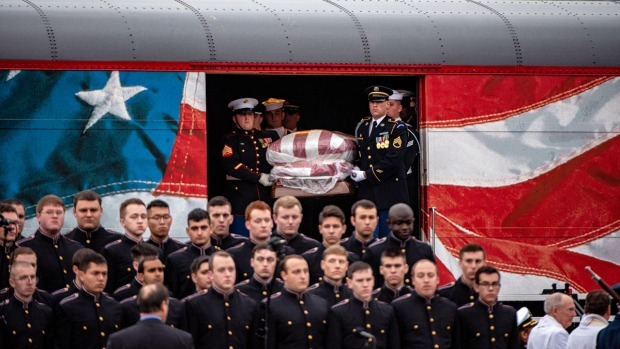 Bush's funeral made for an awkward moment at an otherwise solemn event. Jimmy and Rosalynn Carter, Bill and Hillary Clinton, Barack and Michelle Obama, and Donald and Melania Trump sat shoulder to shoulder in the first row. It was the first time Hillary Clinton and President Donald Trump were in the same room — let alone within a few feet of each other — since Trump's 2016 inauguration. At his political rallies, Trump has continued to lead chants of "Lock her up," referring to the now closed federal investigation into allegations that Clinton had misused a personal email account for government communications. Trump has also continuously accused the Clintons of colluding with “Russia and lots of other people,” NBC News reported in October, though there’s no evidence that those allegations are true. Clinton has expressed concerns about how Trump is running the White House. During the funeral, Clinton appeared to keep her eyes fixed on the altar before the group. As Trump made his way to the front pew of the church, he shook hands with the Obamas but didn’t appear to acknowledge the Clintons. Melania Trump, however, did shake hands with Bill Clinton and wave at Hillary Clinton. The Obamas were seated between the Trumps and Clintons, and Michelle Obama sat between the political rivals with furrowed eyebrows and down-turned lips. Barack Obama sat cross-legged with his face turned. 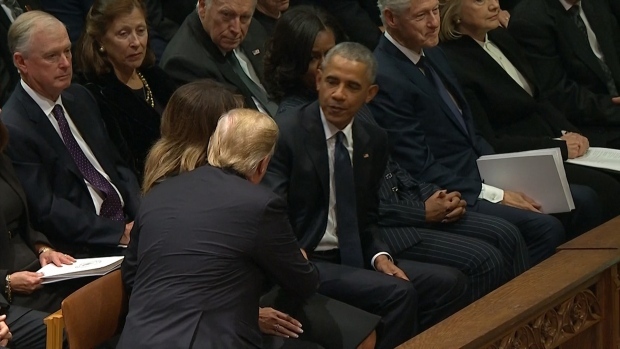 Michelle Obama’s expression only changed when George W. Bush leaned over the pew to greet them and slip her an offering. As he grabbed Michelle Obama’s hand, a smile spread across her face. Laura Bush also came over to say hello, shaking hands with Trump and waving to Melania Trump. Despite the general tension among the first pew's occupants, George W. Bush and Michelle Obama's moment reminded onlookers of the message sent by their cough drop exchange at the McCain funeral. At the time, Obama noted that despite being a "simple gesture," the moment illustrated a larger lesson about how politicians should treat each other. "[People are] hungry for what we all know: that party doesn’t separate us. Color, gender — those kinds of things don’t separate us," Obama said on the "Today" show. "And if we’re the adults and leaders in the room, and we’re not showing that level of decency, we cannot expect our children to do the same."